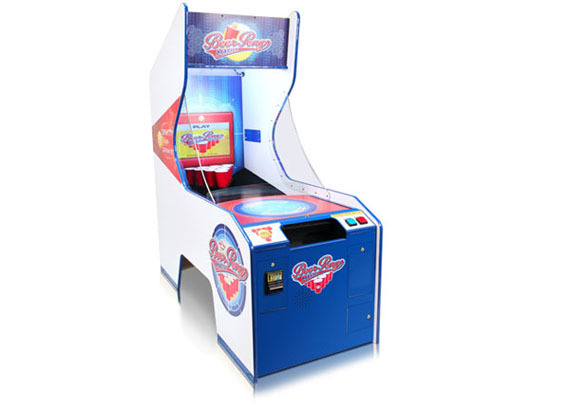 This is the Beer Pong Master, an arcade game that tests your beer pong skills. The fratty machine is brought to us by Bay Tek Games. Unfortunately, it does NOT make you drink all the beers at the end. In fact, this thing doesn’t actually incorporate beer in any way except for in the title. RUDE. To see the thing in action, peep the video which also features my internet buddy Elie from FoodBeast. Of course, when I say buddy, I’m using that term loosely. He’s more of a… how do I explain this? He’s mean to me. It’s kind of like cyber-bullying except we actually met in person once. Yeah, he invited me to a party. He was mean to me then, too, but the music was super loud so I pretended like I couldn’t hear what he was sayin. Luh yew boo!